Getting out in the mountains or dunes is an adventure with an SUV. Under-body protection is available in many SUVs, and they have higher clearance for maneuvering on rough terrain. 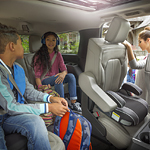 An SUV can get passengers and gear to an off-road destination, so you can worry about having fun instead of how you are going to transport your gear.